The Cruiser 32, smallest in Bavaria’s new line of family cruising boats, is one of the more ambitious boats I’ve come across recently. Like its larger sisters, it boasts a very modern hull form with a fine entry that carries lots of beam aft. 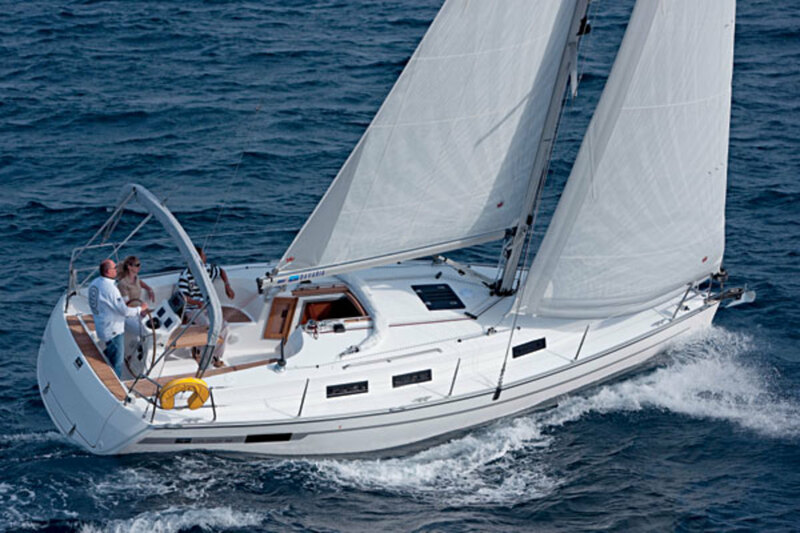 The Cruiser 32, smallest in Bavaria’s new line of family cruising boats, is one of the more ambitious boats I’ve come across recently. Like its larger sisters, it boasts a very modern hull form with a fine entry that carries lots of beam aft. It also has a voluminous cabinhouse and lots of freeboard, so it isn’t exactly surprising when you step aboard and find the boat seems quite large for its length. In most respects the boat succeeds in realizing its ambition. The cockpit, for example, seems enormous for a boat this small and works very well. There’s space for bench seats long enough to sleep on, high coamings for comfort and security, a fixed table with folding leaves, and an absolutely cavernous stowage locker to port. All the way aft there’s also a large fold-down transom controlled with gas struts that deploys easily and offers great access to the water. Likewise, on stepping into the head below you’ll be convinced you are on a much larger boat. There’s plenty of room to shower and move around in and a dedicated wet locker for hanging up damp foulies—a very nice touch. Both the galley (set to starboard, with a fantastic integral trash bin under the sink) and the saloon are about as large as they could reasonably be on a boat this size. The staterooms, meanwhile, have more floor space than you’d expect, though the berths are a little cramped. The aft double has plenty of horizontal area but limited vertical clearance, while the V-berth has a rather pinched foot. Large people may not want to share these bunks, but the settees in the saloon are long enough to also double as berths, so there’s still ample space for sacking out. Our test boat had a shoal-draft keel plus an in-mast furling mainsail (something I personally would not recommend on a boat this size), so I was surprised when it sailed as well as it did in the light conditions we had on Chesapeake Bay off Annapolis. In winds ranging from 5 to 10 knots, we managed to maintain 4.7 knots of boatspeed sailing as high as 35 degrees relative to the apparent wind. Cracking off to 40 degrees, our speed jumped to 5.2 knots. With a battened mainsail and a deep keel, I expect this boat would do very well to windward. Sailing on a broad reach we managed only 2.5 to 3.5 knots. With a proper A-sail set on the optional bowsprit, however, this would be very easy to improve upon. I was also surprised by how well the boat motored. We made 6.4 knots in flat water turning 2,300 rpm, and this improved to 7.4 knots when I punched her up to maximum throttle (2,900 rpm). My only real complaint about the Cruiser 32 is that it looks a bit slab-sided and bulky, at least from certain angles. This is only to be expected, however, when a designer fits so much comfortable space into such a short boat. 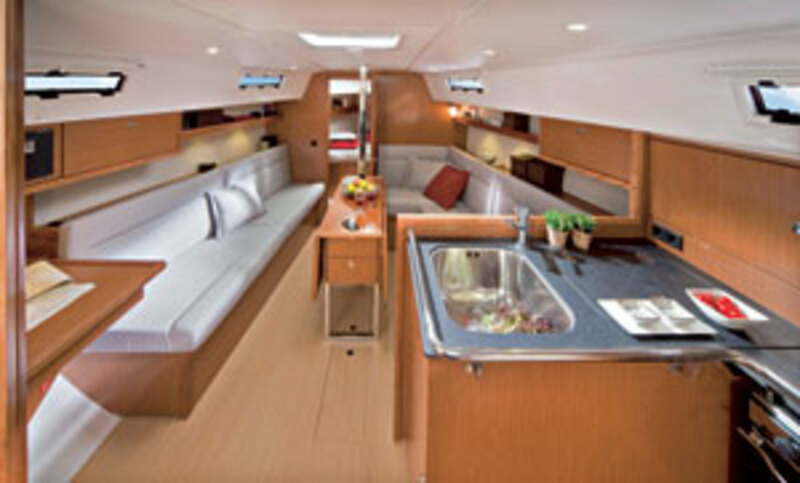 If you want a sleeker looking boat, you’ll have to put up with a lot less living space to get it.